June | 2014 | Lamb on a bike! I had a pleasant but fairly unremarkable ride this weekend, 50 sunny miles in the Surrey lanes. One thing I noticed was that everyone was really friendly. Was it the sunshine? I’m sure people aren’t normally that friendly. At one point I was sitting against a signpost eating a snack and everyone who went past asked if I was okay. Either I eat with a really pained look on my face or they wanted some of my delicious homemade flapjacks. I ran out of water and had to fill up my bottles at a tap marked “danger do not drink”. I was so thirsty I would have drunk out of a puddle by that point. I felt like our cat when I see him drinking rainwater out of flowerpots and the upturned lawnmower. 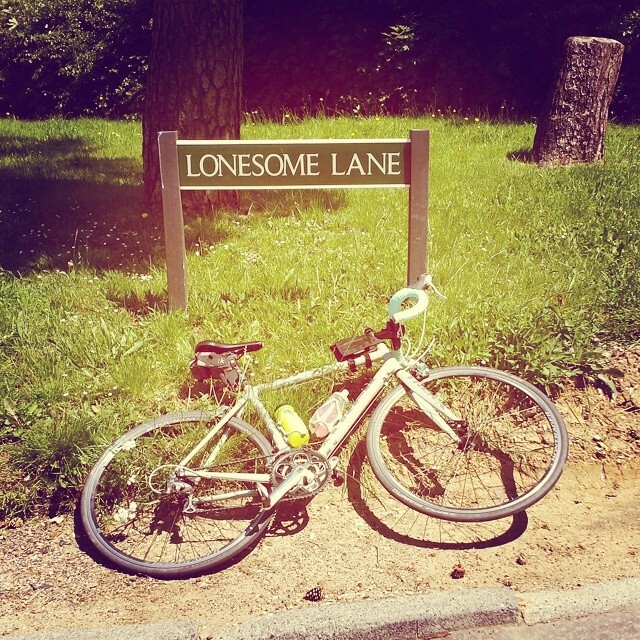 Appropriately for a solo ride, I went down Lonesome Lane. And I sang Elvis. I am now the proud owner of the most ridiculous tanlines ever, after wiping the tops of my thighs with something (sunblock? grease? who knows) and giving myself a stripy badger look. 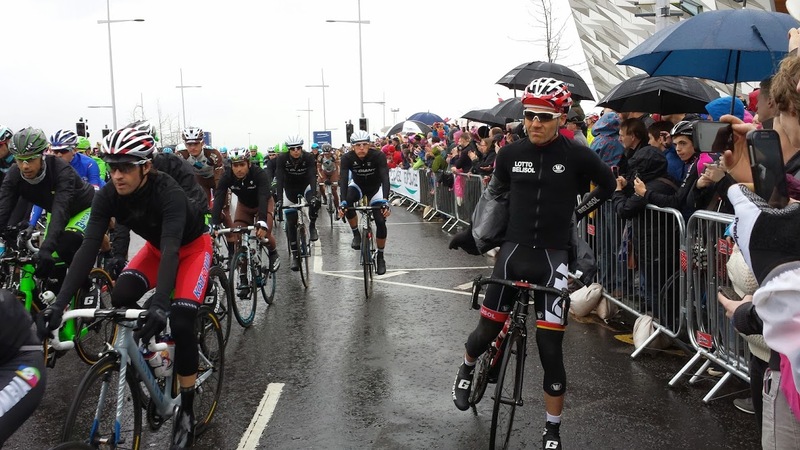 The Giro d’Italia took on an Irish air this year. The first time something on this scale had been to Northern Ireland, and a chance for us to see the Grande Partenza close up. It would seem wrong to go to the Giro without taking bikes, so Tanya and I booked trains to Belfast. There are three train routes to Belfast – via Cairnryan (not possible due to a bus transfer from Ayr to Cairnryan), via Liverpool (not possible due to a transfer through the Mersey tunnel, no bikes allowed) and via Holyhead and Dublin. We arrived at Euston later than planned, and by the time we’d collected the 40 tickets needed for our journey and gone to the train, the inspector refused to let us on. In a rage, we went to the ticket office to ask about other trains so we could get our connecting ferry and were told it wasn’t possible. I looked up trains online and sent Tanya back to tell them that we wanted to take another connection via Warrington, and the third member of staff we spoke to was a good egg and let us take this train. At Warrington, our train arrived late, meaning a mad dash across the station, carrying our bikes up stairs. We were due to arrive at Holyhead with 28 minutes before our ferry left, 2 minutes later than the time the ferry company say you can check in. We arrived a few minutes early but had to push people trying to get on the train out of the way (what happened to letting people off before you get on?) and legged it to the ticket desk, where we were told our tickets didn’t allow bikes. I insisted that they did and eventually the lady gave in, called the check in desk and we were allowed through – a quick cycle through the port and on to the ferry. Arriving in Dublin was stress-free, though Dublin port looks a lot like Dunkirk, AKA a massive shithole. We took the Enterprise from Dublin to Belfast, the slowest intercity train ever. At Belfast Central we had a minute before the train to Bangor (our final destination), meaning another bike carrying on stairs incident and Tanya wedging herself in the door to allow us both on. 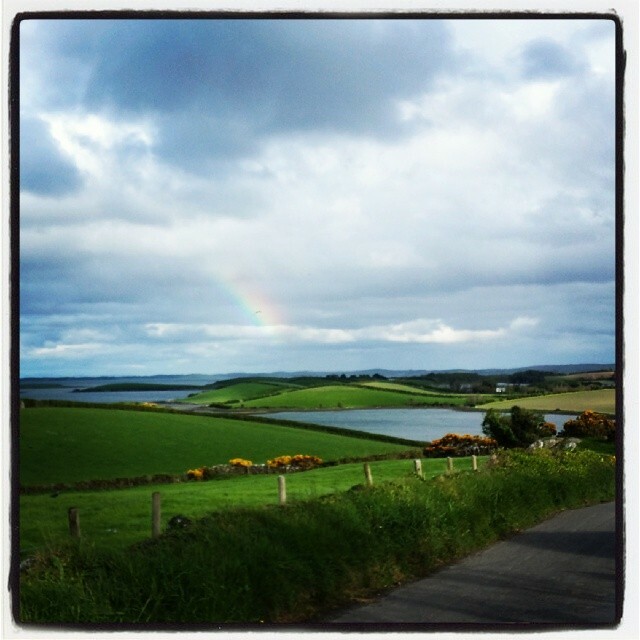 We had two days before the Giro got under way, and spent the first day cycling around Strangford Lough. This kicked off with a long stretch along a dual carriageway (where we passed the FDJ team practising their time trialling), before riding into a headwind all the way to the Strangford ferry at the south of the lough. It really was quite unpleasant. Along with the wind there was a bit of rain too and lots of drivers passing too close. After crossing the scarily deep lough, we went in to a pub for some lunch. Tanya asked if there was anywhere we could put our bikes, and the owner let us leave them against the bar while we sat in front of an open fire, drying our soggy socks and eating homemade soup. 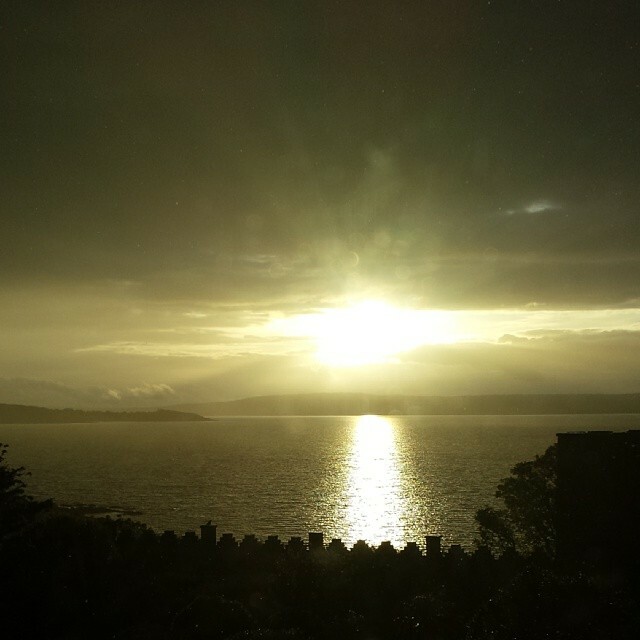 Not only a welcome pitstop but a super warm welcome at the Cuan Guesthouse – would recommend. During lunch the wind changed direction so we then had a headwind heading back north again, and a few more main roads before we got to little scenic roads again. Near the top of the lough, facing darkness and an unwillingness to go on the dual carriageway again we called it a day. Cycling is supposed to be fun and fun was running out. 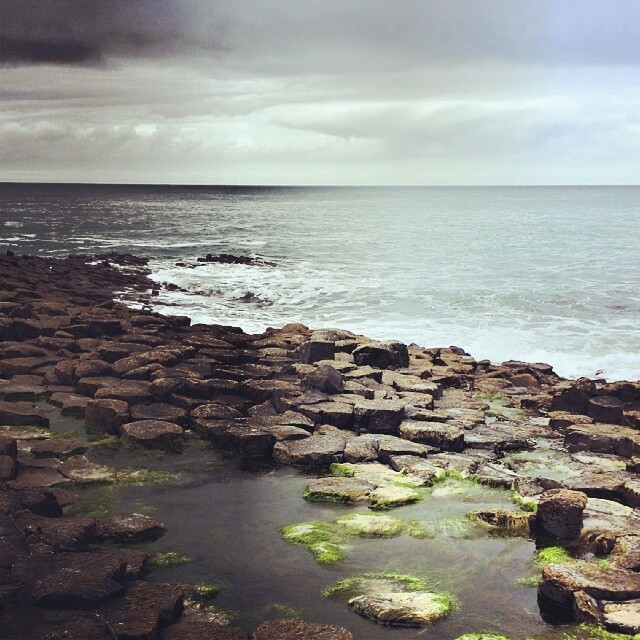 The following day we drove up to Giant’s Causeway. This was a fantastic drive along the coastal road – frighteningly steep hills, majestic views, vast empty landscapes. At one point, just before an almost vertical hill, we spotted a national cycle route sign. I pity whoever tries cycling up there, that would be a hell of a long walk. In the rain. 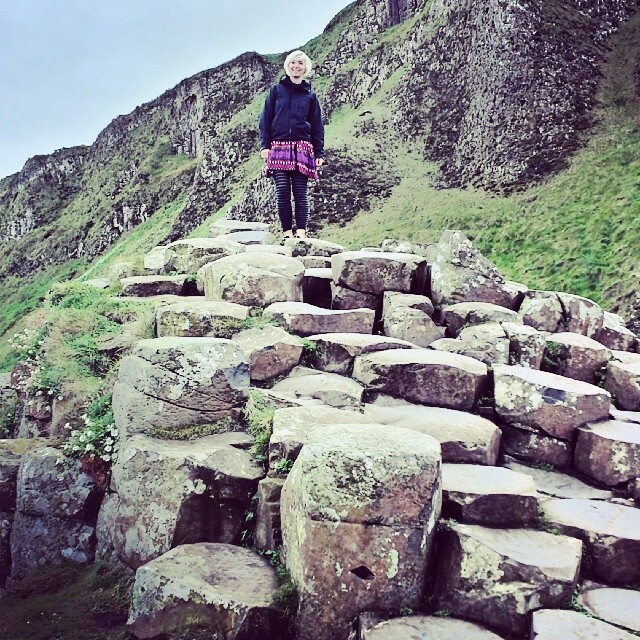 Giant’s Causeway is fascinating, I found it baffling that something like this could be created naturally. 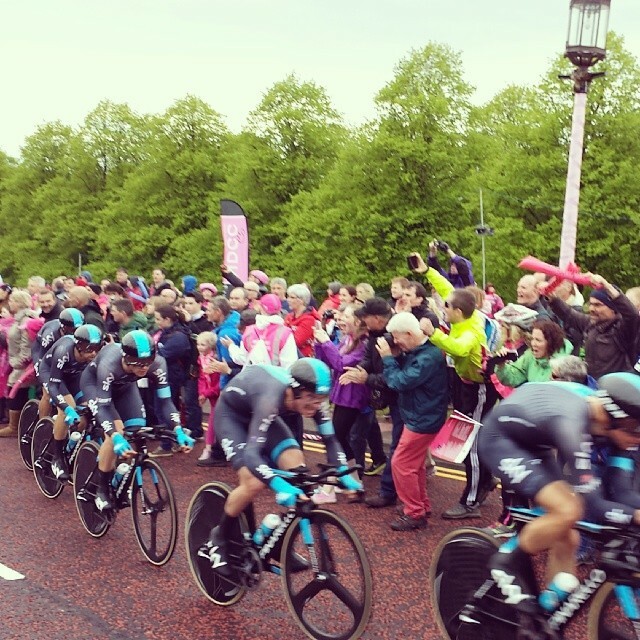 Throughout the drive we saw a lot of pink, and huge amounts of excitement for the Giro. Schools were putting up pink bunting, people had painted their sheep pink, tractors were painted pink, villages had pink bikes by the village sign, the pub, the shop… It was great to see so much Giro buzz (despite the leaflet produced by the NI tourist board starting off with “What is the Giro? And why is it here?”). That evening the team presentation was held at Belfast City Hall, where we met up with some friends from London. The stage had been set up so that when you looked at it, the late afternoon sun got you right in the eyes. I assume the organisers hadn’t thought there’d be sun. After a bit of casual sexism (“look, here are some girls in improbably high heels wearing the winner’s jerseys!”) the teams came out, to what I can only imagine was a carefully chosen soundtrack. The riders walked up on to the stage, apart from the team leader who rode up… apart from Dan Martin, who showed his amazing bike handling skills by walking up, pushing the bike. The celebrities were interviewed by one of the two hosts (one did the English interviews, the other the Italian ones, translating where necessary – the Italian chap drew the short straw and had to interview Quintana in hesitant Spanish) and there was lots of cheering. No one said anything massively insightful – I’m so happy to be here, the crowd is great, Northern Ireland is great, I hope to do well at the Giro but I’m sure as hell not telling you my tactics. Once all the teams were out and the mayor had made a little speech, balloons were released and confetti fired from cannons, and almost everyone beat a hasty retreat as the rest of the entertainment looked uninspiring. Day 1 of the Giro was a team time trial. We decided to watch at Stormont, the only hill on the course, and an interesting backdrop as the Norn Iron parliament. This was a good decision as we were by a big screen showing what was going on elsewhere on the course, and could get really close to the teams as they came by. Team Colombia were first out and it was clear to see that they aren’t time triallists, particularly compared to the next team out, Orica Greenedge, who smashed it. Just as they were ending their attempt it started raining, first in town (so not where we were) and then out at Stormont. 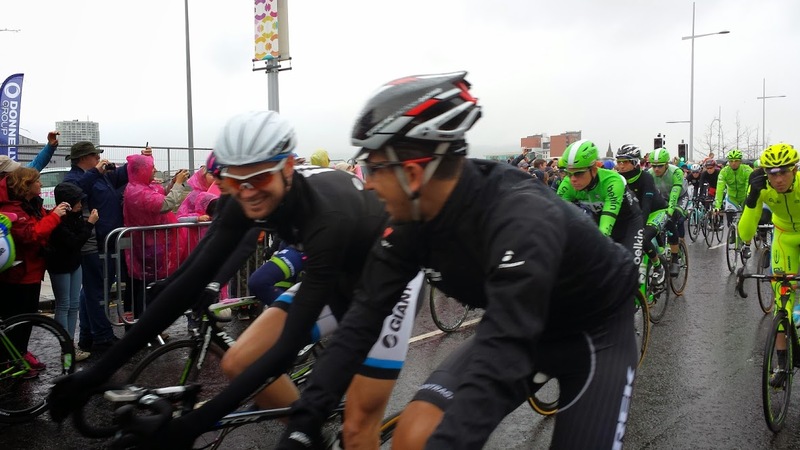 We watched the subsequent teams, in the rain, as the crowds on Stormont got closer and closer to the riders and no team could get near to OGE’s time. On the big screen we saw the Garmin crash, and a weird silence descended as Irishman Dan Martin was so clearly out of the race from the moment he put his hand to his collarbone. Poor Dan and the jibes we’d made about his bike handling skills the day before. People complain that team time trials aren’t interesting but we definitely weren’t bored – our only complaint was the commentator at Stormont shouting all over the commentary, when he knew nothing about cycling. Day 2 started at Belfast’s Titanic Quarter and went up to the Giant’s Causeway, before coming back to City Hall for a sprint finish. We got to the Titanic Quarter in time to have a good wander about the team paddock. All the motor homes were parked up, with bikes either on stands or leaning against the vans. Riders, team staff and fans were all milling about. 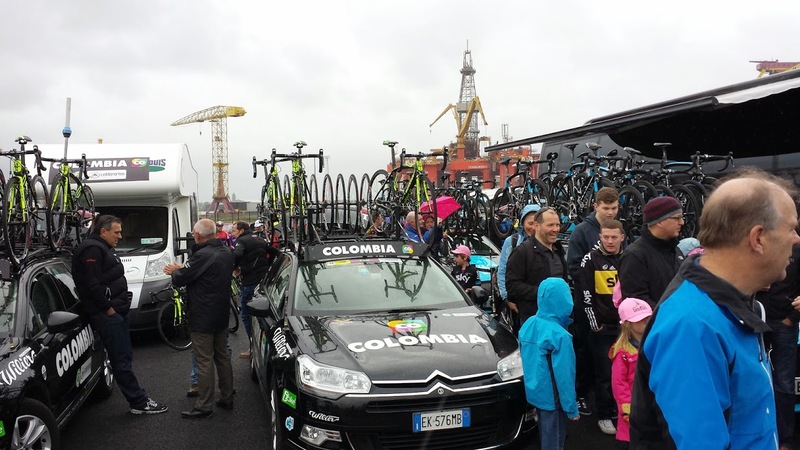 It felt very strange to be that close to the riders – we touched some bikes and hung out with the Team Colombia riders. Their van was tiny, and was parked next to Sky’s deathstar. Then again, Team Colombia are all really tiny, riding teeny tiny little bikes. After milling about for a while, the riders all went to sign on and we went to find the start line. We wandered down to the road and managed to position ourselves almost in the road. This turned out to be a perfect place to be, as when the riders set off we were a metre from them. 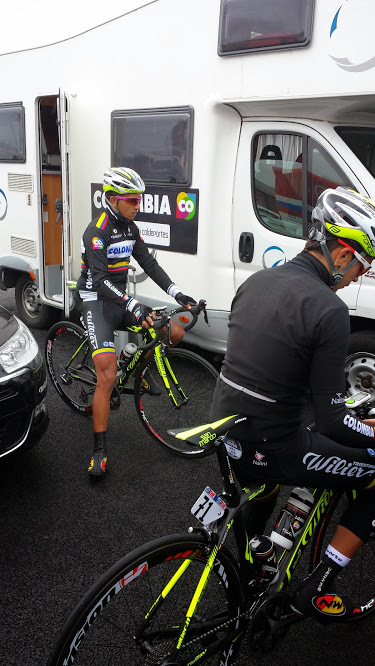 Quintana set off with this Colombian friends. Kittel stared me in the eyes. Cadel passed within spitting distance. Everyone looked cold, a few riders stopped to put on jackets. A few were eating sandwiches! It was nice to see riders smiling and chatting. While the riders got wet riding around the Northern Irish countryside, we went to a bike shop out of town (the world’s largest online bike retailer, apparently! ), passing through a loyalist area – including wood piles for the marches, marching bands and stall selling union jacks. The pavement had been painted in union jack colours. It was WEIRD. After milling about in the shops we headed back to town to see the end. City Hall was busy, and we couldn’t get close to the action – but the atmosphere was still great, and the noise as the riders got closer was fantastic. We headed to the Crown Inn to toast a successful Giro trip, when I realised I’d left my Garmin on my bike and had to sprint off to retrieve it – amazingly, it was still there. The following morning we successfully used needle-nose pliers to take the wheel off Tanya’s bike (having lost the pitlock key earlier in the holiday) and got a lift to Belfast station, where we began the long journey home, with bonus torrential rain in Dublin. I’m really pleased we went, it was fantastic to see a Grand Tour up close like this. My brother last year went to see the Giro and his pictures on Instagram were of riders streaking past in the sunshine. 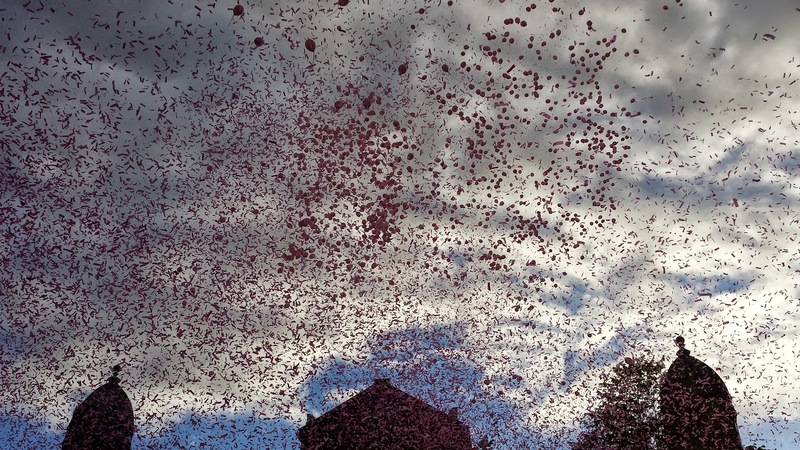 My photos were the same, but more crowds, more pink and more rain. Bout ye, Giro!